I grew up in Sonora, CA, which is a small town in the northern California foothills. It has very small-town atmosphere, where everybody knows everybody and their business. Sonora definitely influenced me in positive and negative ways. I started getting tattoos December 2009. I am glad I waited a few years before being tattooed. I would call it contemporary or pop surrealism. I like how tattoos are becoming more socially acceptable these days, but I do think there are too many tattoo shops around. I love art in all forms and especially art I can wear on my body. I have always wanted tattoos, ever since I can remember as a child growing up. 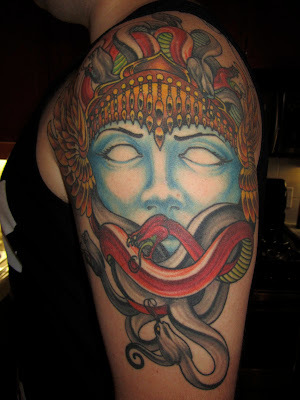 My favorite piece is the Medusa on my right arm. It depicts Medusa before she was turned into a serpent and she’s surrounded by red roses. Yeah, I do catch a lot of people starring at them. I like when people ask me about them and I also enjoy when people give me dirty looks because of them. Yeah, they do cheer me up sometimes when I’m feeling down. I don’t have any tattoos that pay tribute to anyone or hold deep sentiment. I think they are all equally significant and all have different meanings to me. Somebody once told me that the only tattoos they regretted were the ones that meant the most to them. That statement really made me think about not over analyzing any potential tattoo ideas. 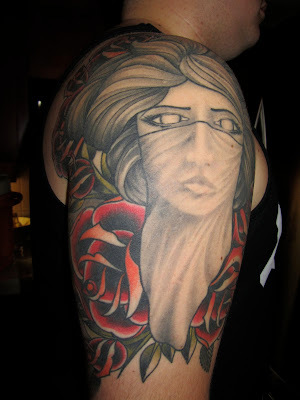 My next tattoo is going to be a few black roses on my left arm, between my Medusa and skull tattoos. I would tell them to take their time and find the best shop and artist they can afford. I would also tell them to not get too intricate with trivial details. Give the artist the freedom to be an artist. Life has taught me to never judge people until you really get to know them and their point of view. Yeah, it will probably never stop! I plan on getting full sleeves, my chest done and back done. “The courage of the shut mouth, in spite of artillery” Sylvia Plath. I would like to thank my artist Kevin Dickinson at Guru Tattoo, in San Diego. Also, thank you Mr.Tattoos for featuring me on your website!